Bangalore, 24 October 2016: The Akshaya Patra Foundation appointed Shivant Malkani as its first Youth Ambassador. Shivant, who is currently studying in class 11, was chosen as the ambassador for his dedication and exuberance towards Akshaya Patra programs. He has recently written a book titled ‘Food’ where he has compiled vegetarian recipes and dedicated it to Akshaya Patra. He has pledged all sales proceeds of this book to the Foundation. CEO of Akshaya Patra, Mr. Shridhar Venkat chose Shivant as the first youth ambassador. The youth ambassador program has been implemented successfully by Akshaya Patra’s US office. Under this program, young competent boys and girls are chosen from middle and higher schools and appointed as ambassadors of Akshaya Patra. They are trained in spoken and networking skills, and are given all the required support. Once trained, they move out to promote the cause of Akshaya Patra in their peer group. About The Akshaya Patra Foundation: The Akshaya Patra Foundation is a not-for-profit organization headquartered in Bengaluru, India. The organization strives to fight issues like hunger and malnutrition in India. 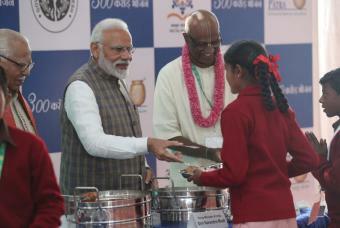 By implementing the Mid-Day Meal Scheme (MDMS) in Government schools and Government-aided schools, Akshaya Patra doesn’t just aim to fight hunger but also to bring children to school.